Tibia is an old MMO. Like, really old. Like, came-out-last-century old. As such, it’s as grindy as they come and death can cost you days of your hard-earned experience. 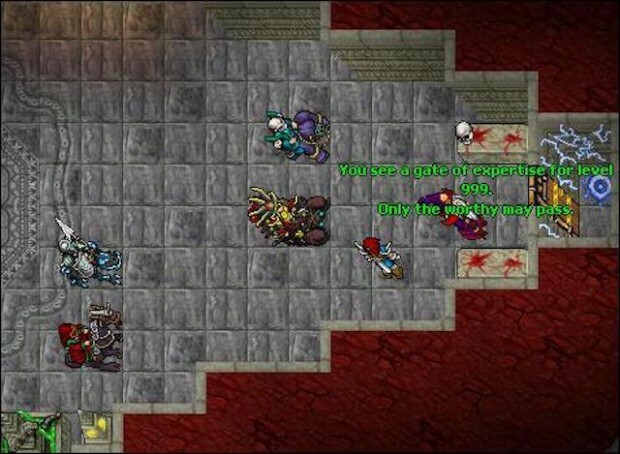 Undaunted by the game’s challenges, last year one player, Kharsek, reached level 999, finally granting him access to a special door in the game that could only be opened by players who reached that lofty milestone. It took him nine years. And what’s behind that door? Kharsek isn’t telling. But another player has also reached level 999, and he will reveal what’s behind that door — for a price. Polish Tibia player Dev onica has hit the magical milestone, but he’s not giving away the game’s secrets for free. He set up a donation bar on his streaming page, asking for $5,000 before he would reveal Tibia’s greatest mystery. He’s since downgraded his “request” to $2,000. Dev onica “has a bit of a bad rep in the community,” according to one Tibia blogger, and he’s not required to fulfill his obligation even if he does reach his funding milestone. His friend and fellow player, Moonzinn, is right behind him, at level 985, but he seems to be of a similar mindset. After those two, three other players are withing shouting distance of level 999, but they’ve still got months of grinding ahead of them, so it might still be a while before Tibia’s biggest secret is laid bare. Tibia is still one of my most favorite MMORPGs. Even though the graphics are outdated and there are very few animations ingame i still enjoyed it and still have the urge to go back. I’ve started playing Tibia way back in 1997 and quit later due to losing quite a few stuff + levels. I went back a few years ago though my account didn’t seem to exist anymore but still i was fine with starting anew but to my surprise there were more bots ingame than active players which ruined the fun quite fast. I don’t know whether they can’t do anything about all those bots or just don’t want to bother with it but i personally won’t return to Tibia and keep the good old memories i had when i first started it but who knows.. maybe in a few years, if it’s still op and running and a new server should open i might actually give it another try.